Perhaps no symbol of western New Jersey is better known than the landmark Red Mill at Clinton. 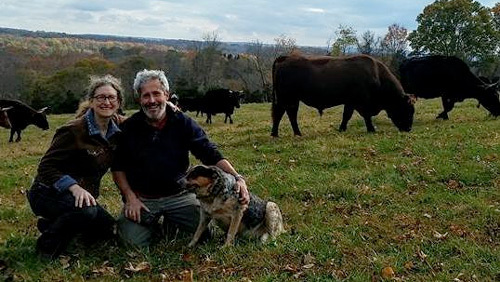 Located just below the confluence of Spruce Run and the South Branch of the Raritan, on the west end of Main Street, the mill and its surroundings have played host to a succession of industries and activities spawned by the region's remarkably rich agriculture. The Red Mill in spring. Photo by Dan Bacon. 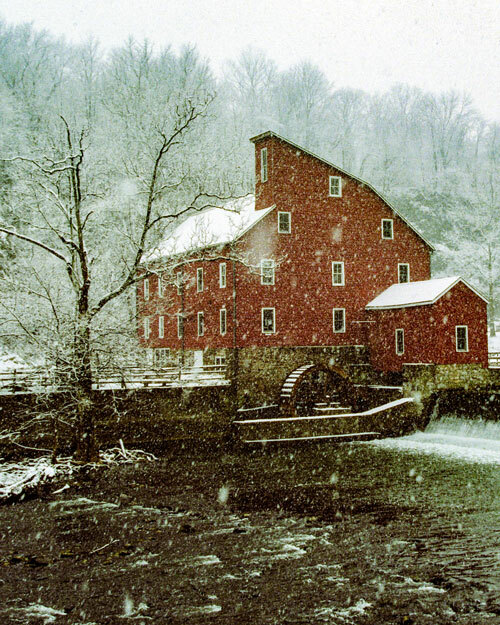 The Red Mill was built about 1812 to process wool. In its early days it was not nearly so large, nor was it likely painted red. All through the next one hundred years the structure would be expanded and altered to accommodate different endeavors; the enterprises included grist milling, plaster and talc grinding, graphite processing and peach-basket production. In the 1830s a large stone mill would be constructed across the river on the east bank; the proprietors here stuck to grinding grain; and the two mills stood and stand yet as eloquent testimony to a once keen harmony between man's needs and Nature's possibilities. The men who envisioned the power of their lives harnessed for industry were not unusual for the nineteenth century. The countryside was dotted with all manner of waterpowered operations. Those who added to the Red Mill did not seek to create a landmark, but simply to follow the changing economics of the times. The carpenters who added the unique roofline extension did so only to accommodate some machinery in 1908; they could little imagine how this added bit of character would inspire artists, photographers, historians and civic leaders though the century. In 1960 five visionary businessmen, just old enough to remember the days of mills, horses and such, purchased the distinctive structure, gave it a new coat of red paint, and started the Clinton Historical Museum; in a few years the Mulligan limestone quarry to the rear of the mill was added to the property along with the old quarry buildings; a mid-nineteenth century dwelling for workers, a stone shed converted to a blacksmith shop, and the quarry office along with several structures key to the industry; a massive lime kiln, and imposing lime-screening building, a shed for dynamite storage, and a one-man worker's shack. In the 1970s a one-room school house from Alexandria Township was moved to the site, as well as two long wagon sheds from local churches. A log cabin, representative of the birthplace of Hunterdon County's Revolutionary War hero General Daniel Morgan, was constructed in 1976. An administration building was also added alongside the mill. Today the site is known as The Red Mill Museum Village. A wide variety of special programs are offered for schools and the general public. The Red Mill Shop, located on the first floor of the widely-recognized and beloved old mill, features a variety of gifts and historical reproductions. The upper floors are devoted to Hunterdon County history. 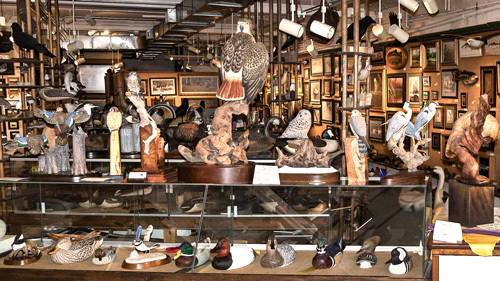 Numerous items from the Museum's 40,000 piece collection are on display. 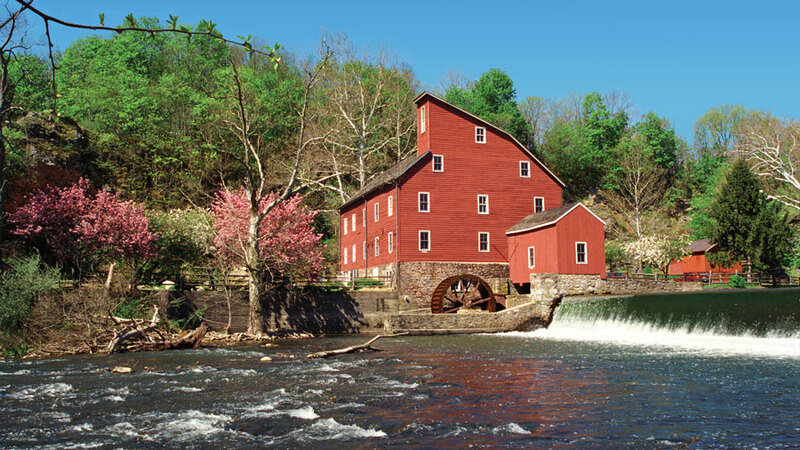 In 1952 a group composed of artists and community leaders acquired the stone gristmill for use as a nonprofit cultural center. The building was extensively rehabilitated and now is the home of the Hunterdon Museum of Art. 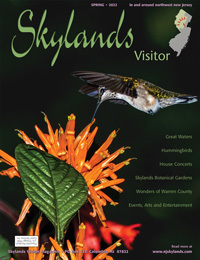 Exhibitions feature local, national and international artists. The galleries are open Wednesday - Sunday, 11am - 5pm. The Museum charges an admission fee. The museum sites are connected by a picturesque iron bridge constructed in 1870. The bridge contains walking paths that are kept separate from the traffic by heavy wrought iron rails. Even though this bridge is part of Main Street, serious trout fishermen are often glimpsed angling from the bridges walking paths. Just beyond the west end of the bridge is the Clinton House; a surviving nineteenth-century establishment renowned for its fine food. At the east end of the bridge-- just beyond the Art Center- is the old downtown business district. Unlike many communities, Clinton has not only preserved its Victorian atmosphere, but enhanced it with an unmistakable elegance that is neither heavy-handed nor exclusionary; the town still maintains a rural, even casual air that visitors seem to find refreshing. 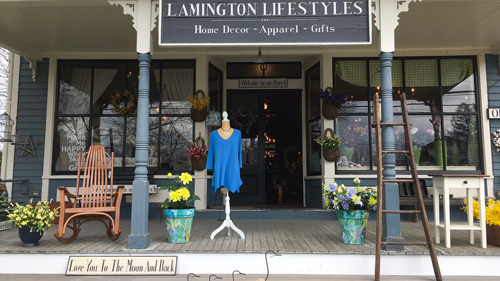 While many of Clinton's establishments cater to a more sophisticated audience than the Victorians, the storefronts and signs proudly maintain a traditional character, clearly reflecting the local merchants' pride in being part of a very special place. The people who built the buildings by the river could not have foreseen all this of course. Some have suggested that they might be disappointed to find their architecture utilized so differently. I think it unlikely. Museum, history, art, good places to eat, antique shops and the like? The people who make up the town seem to understand that preservation is not simply the safeguarding of old things for old thing's sake, but rather for the vitality that quality from the past can add to contemporary life. The synthesis of old and new works well here. The friendly faces on Clinton's Main Street speak volumes.